Thursday morning temperatures in the mid 70s will rise to highs in the mid to upper 80s in South Florida by early afternoon. The morning will be mostly dry. Some patchy fog may develop, but should lift by 8 a.m. Expect increasing clouds and developing thunderstorms in the afternoon. Some storms may become strong with heavy rain, gusty winds, hail and frequent lightning. The chance of storms increases ahead of a cold front that will near Thursday afternoon and pass through late. 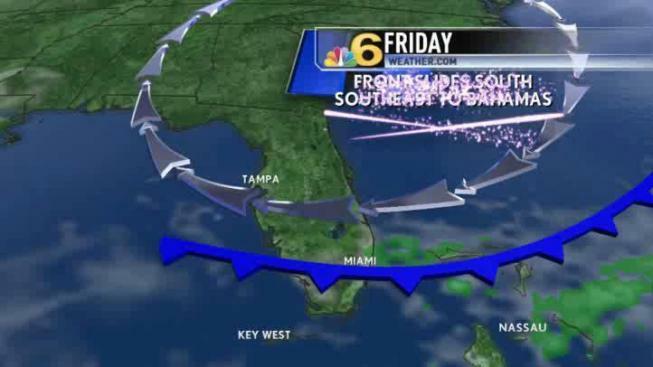 Friday should be drier and brighter as the front pulls away from South Florida. Partly sunny skies and an isolated shower are in the forecast Friday.